Camper trailers are smaller versions of travel trailers that can be towed with any kind of truck or automobile. They are also referred to as popups. They feature a solid base made of wood or metal, with canvas stretched over a collapsible frame. Upon reaching a camp site, the camper can be unfolded with the frame detached from the base, forming a suspended tent on the ground. The camper trailer is often used for a short trips, weekend vacations or picnics. The trailer has to be towed along a road, and is only suitable for camping areas with paved automobile-friendly roads leading in and out of them. After deploying the canvas, the camper has enough space for two people to sleep in comfort. Inflatable mattresses or sleeping bags can be used to sleep comfortably in the base of the trailer. The camper trailer can be used a tent even if there is no level ground. The hassle of pitching a tent is saved, as the trailer only requires some spikes to be pushed into the ground to support the structure. All one has to do is to unfold the tent and snap it in place. The canvas cover is strong enough and does not require any ropes or other supports to keep it in shape. Since the tent part of the camper is raised a bit above the ground, there is considerably less chance of attack by reptiles or other animals. This is very helpful when it comes to protecting children on weekend trips or overnight campouts. Although similar, today’s modern trailer camper offers a much wider range of facilities, which include the likes of fans, small refrigerators and other devices which allow its users to enjoy many of the comforts of home even when camping out. If a portable power source is present on the campsite, these devices can be easily run whenever required. There is a lot of space available inside the tent, as the frame is well extended beyond the size of the base. The larger space allows the people inside to spread out comfortably. Let us review some of the best trailer campers currently available on the market. This is brilliant camper trailer designed especially for young families, and can be the home to many beautiful memories of camping trips. It can be used anywhere, ranging from mountainous to beaches and wide open plains. Its simple yet elegant construction minimizes hassle when setting it up and it is also very much secure. This little teardrop-shaped trailer camper sports a sturdy construction, and has a hard top. Its exterior is made of fiberglass. It features two slider windows, located on its two doors, providing a great degree of safety and privacy. There is also a hatch which provides a beautiful view of the outside. Adequate ventilation is secured by means of a big roof vent. The wheels are made up of aluminum alloy, and are simply beautiful to behold. The sides and floor of the camper are carpeted. Its interior lights and bevy of cabinets make it a wonderful environment for enjoying camping trips to the fullest. The 4-Wide also has a screened cargo area in front of it. The dimensions of the payload platform are 48 inches by 16 inches, allowing it to carry heavy electronic appliances or bicycles with ease. This camper is suitable for one user only due to its very small size. 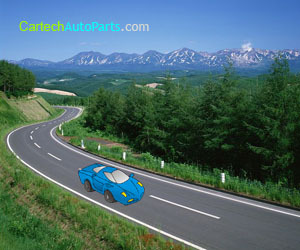 It is very light, and can be drawn by a small car or even a motorcycle. It has all the standard features of Little Guy camper trailers, and is made of light materials like tubular steel. It has a height of 68 inches and a length of 88 inches. Its curb weight is less than 500 pounds, and it has a touch weight of only 50 pounds.